Rise and Shine! The Pancake Queen, the Ladybug Queen and ten of their closest friends have fallen under a sleeping spell and it's your job to wake them up. Use strategy, quick thinking and a little luck to rouse these napping nobles from their royal slumbers. Play a knight to steal a queen or take a chance on a juggling jester. But watch out for wicked potions and dastardly dragons! The player who wakes the most queens wins. Deluxe anniversary edition includes new queens and kings, plus sticker sheets, all in a collectible tin. We're proud to introduce this deluxe anniversary version of Sleeping Queens, or as we've affectionately dubbed it, the "Strawberry Queen" edition. Why the Strawberry Queen? 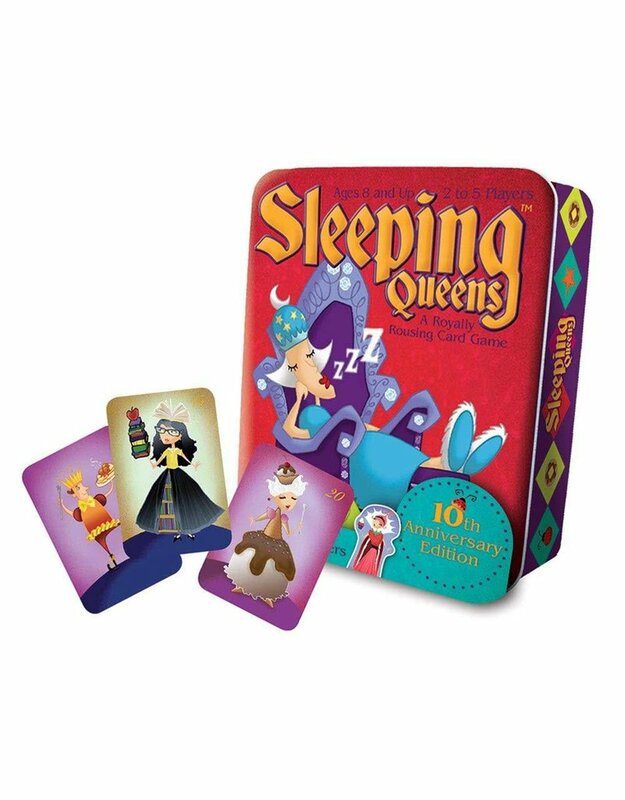 Well, the story goes that when we first produced Sleeping Queens we asked 8-year-old game inventor Miranda Evarts and family to brainstorm a long list of queens for us to choose from. We narrowed down the list based on a variety of factors, but accidentally left out Miranda's favorite queen from the original 12 - The Strawberry Queen. So this edition not only rectifies our oversight, but also adds some special powers to her royal Strawberryness - namely that she can't be stolen or put back to sleep!